Here's a little bit about the Adidam spiritual community of Lake County, California. Our fellowship of several hundred devotees is based on our practice together of the Way of Adidam, which is all about the spiritual realization of perfect happiness, through the tangible Blessing of our Spiritual Master, Avatar Adi Da Samraj. 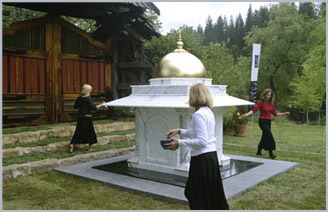 Adidam Lake County is one of many Adidam spiritual communities around the world. Our community is unique in that it is the home of Adidam's oldest Sanctuary, The Mountain Of Attention. Devotees from throughout Northern California (and indeed, from around the world) often converge for devotional occasions and retreats at this sacred place, which is so tangibly full of Adi Da Samraj's Blessing-Force. One of our primary responsibilities (and privileges) as a community is to preserve and beautify these extraordinarily holy grounds. Adidam Lake County is also the organizational center of Adidam, as it houses the offices of the Adidam Avataric Pan-Communion. Many Lake County devotees work in various capacities for the Pan-Communion. The Dawn Horse Press, publisher of Adi Da Samraj's Teaching, is also located in Lake County. Want to know more? Just drop us a line, give us a call, or come to one of our events!